In the Part 1, we have learned how to convert fraction to percent by relating the denominator to 100 by multiplication or division. In this post, we do its ‘algebraic version.’ This method is a generalized method to the previous post especially for numbers that do not divide 100 or cannot be divided by 100 easily. However, to see the relationship between the two methods, let us do the first example in Part 1 of this series. Example 1: What is the equivalent of 1/5 in percent. Simplifying and switching the position of the expressions, we get the . This means that . Of course, Part 1 seems to be easier, but the good thing about putting it into equation is that it applies to all fractions. For instance, it is quite hard to convert 7/12 using the method in part 1. Example 2: What is the equivalent of in percent? We set up the equation with on the left. The curly equal sign means approximately equal to since 3 is a non-terminating decimal. because this is where they derived the rule. 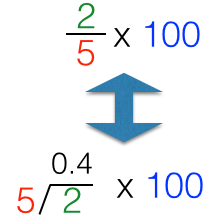 Recall the rule in converting fraction to percent: Divide the fraction and then multiply the result to 100. That is exactly it. Do not forget though that the divisor during division is the denominator (5 in 2/5). as shown below. That’s it. I think we don’t have to have the third part, since we already derived the rule here.